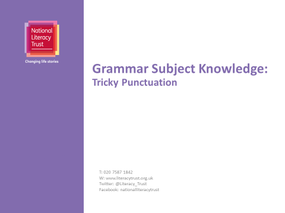 Refresh and secure key grammar subject knowledge with our two downloadable presentations aimed at primary practitioners. The presentations look at two key grammar areas: sentence construction and tricky punctuation. They are designed for use within staff meetings and for use with support staff. The presentations are also helpful for secondary practitioners looking to consolidate progress from Key Stage 2. Also included is a list of our top ten resources for improving grammar subject knowledge.